Since I missed the RPM class , so I decided to walk around looking for food, in other words, Jalan jalan, cari makan. I asked one very stupid question, where can I find food ah ? The recept replied, oh !!! you in Penang , food no problem. Walk this way, you will see Penang Rd... Ok so I walked that way reached Penang Road, I saw Odeon cinema, now showing: Sivaji !!... crossed my mind that maybe I should go watch a movie that night but no la... I think go cari makan better. So Jalan along Penang Road, suddenly can see one road cordoned off, cars not allow to enter all. Then I saw a sign, Pasar Malam everynight, Medan Lebuh Campbell . So I thought ok la, Pasar Malam sure a lot of stalls... mana tau tarak !!! Walk here there everywhere, suddenly I walked down Chintra Street, which then leads down to Kimberly Street. 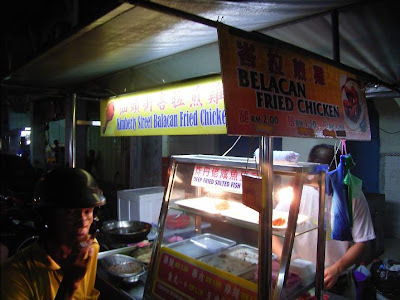 At the junction I saw this Belacan Fried Chicken Stall. I asked the stall owner, so if I buy from you can go into that food court and eat or not ? He said can , so I bought one piece from him. 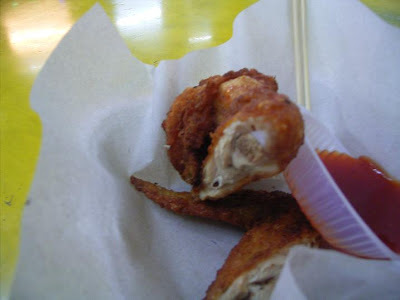 One piece of chicken, only RM1.60... it was hot and cripsy when he handed it to me. It smelt like Fried Chicken, not really like that superb or something like that la. Then I took one bite, fuiyoh..... I don't know what to say.. .. it tasted like Fried Chicken, but then the Belacan taste comes in subtly after. Very clever this guy, the Belacan smell not very strong which was why I didn't smell it while he was frying, but instead it comes in after you bite.. Hmm... really nice !! 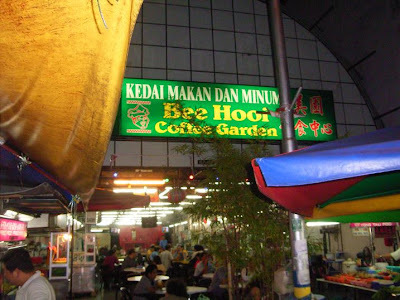 Thats the place I went to, to eat my Fried Chicken. Ordered a glass of Kopi C.. yucks!!! It tasted like terrible coffee. Actually around that vicinity there is a lot of good food. I am not able to tell you off -hand the exact location, but if i am there i will know where to go. 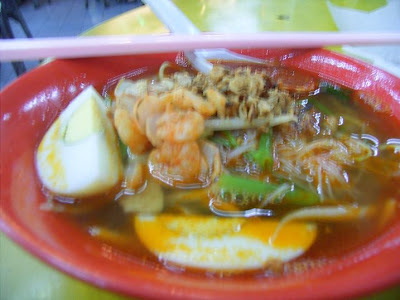 There is the 'brothers' char koay teow (as opposed to the more famous sisters); one brother has since passed on, i think, then there is the koay chiap stall that i really like - which is thick koay teow slabs in a thick duck and innards herbal broth and some good porridge stalls around.